It’s about time we came together to celebrate his masterwork, UNCOMMON KNOWLEDGE (Viridiana, 2015), collected performance texts 1985 – 2012, published one year ago, just a few months before he died in October 2015. As his CDs revealed his gift for fruitful collaboration with musicians & other artists, so this book shows off the interplay between Whitman’s words & the amazing images created by his scratchboard illustrator & Espresso Bar compadre Bruce Litz. It’s a beautiful book, with many of Whitman’s best-remembered rants, songs & monologues—but you’re sure to discover a few new or forgotten gems in the collection, too. Whitman McGowan left this life on October 6, 2015 after fighting the monster brain tumor Glioblastoma multiforme for two years. He is truly a luminary without boundaries now. His friends and fans are gathering in San Francisco on Sunday, December 13, to remember and celebrate Whitman, his words and his many incarnations as poet, partier, ball-player, filmmaker, coffee jerk, old-fashioned golfer, epic janitor, master of ceremonies, creator of wit and subtext and brilliant fun, Whitbob, the Whitmonster, Trungpa Bumbleché, the big guy, multiplicitous and unique. If you want to attend the memorial, send your email address to trungpa@sonic.net to receive an invitation with the details of time and place. Before he departed, Whitman completed work on a volume of his collected performance pieces 1985 – 2012: Uncommon Knowledge, which includes all his greatest hits, extensive notes on performances, recordings and collaborators, with beautiful scratchboard illustrations by Bruce Litz. 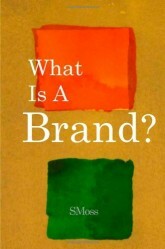 Look for it on sale soon at Zeitgeist Press, Amazon, and here at Luminaries Without Boundaries. The Dr. Hal show performance hyped way back in the last blog felt like a rousing success for me artistically and spiritually; just being able to get up and recite a piece in public again was a personal triumph. I tried a new soundtrack custom built by William Ashford for “First Poet in Space” and it convinced me we have the basis for a new viral video by A Cracked Team of Oldtimers, which includes Puzzling Evidence. It made me feel good to get up and deliver something with some mustard on it, without me feeling I was going into a death spiral. And folks seemed to like it. Thanks, many thanks to everyone who came out and supported me early this year! After being laid low for awhile by a brain surgery (!) back in October, Whitman McGowan is going onstage again Saturday January 18th in the Ask Dr. Hal! show at The Dark Room Theatre. He’s slated to do a cameo, reciting a wry reflection entitled “Father Earth,” trying out a cool new custom instrumental accompaniment by Hollywood composer and longtime collaborator William Ashford. Showtime is 10pm @ 2263 Mission Street (bet. 18th & 19th) San Francisco, CA, 94110, more info @ info@darkroomsf.com. 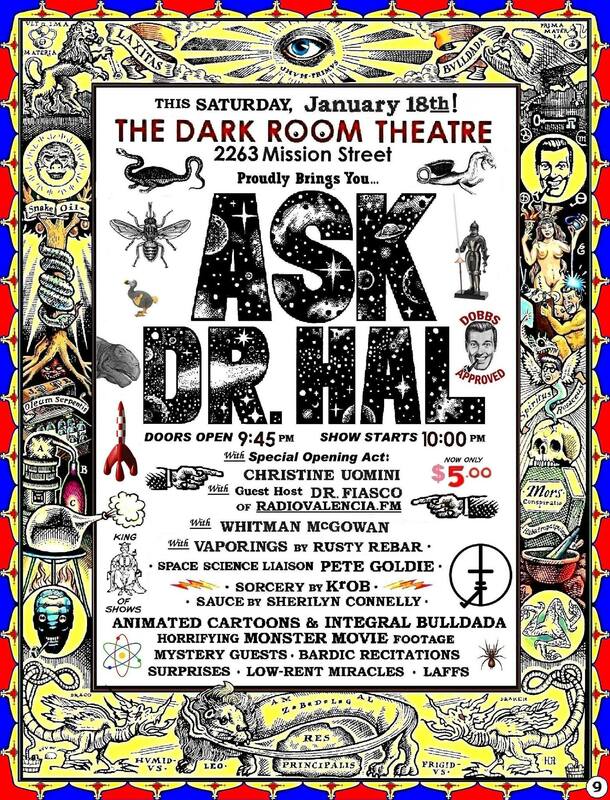 This extravaganza also involves singer Christine Uomini, a science segment featuring Dr. Pete Goldie, cartoons, movies and other visuals and sounds by kRob and Sherilyn Connelly, not to mention poet Rusty Rebar along with the preternatural fortune telling and all seeing mental might of Dr. Hal, all hosted by Radio Valencia’s Dr. Fiasco, and the inimitable experience is yours for an admission fee of only $5. 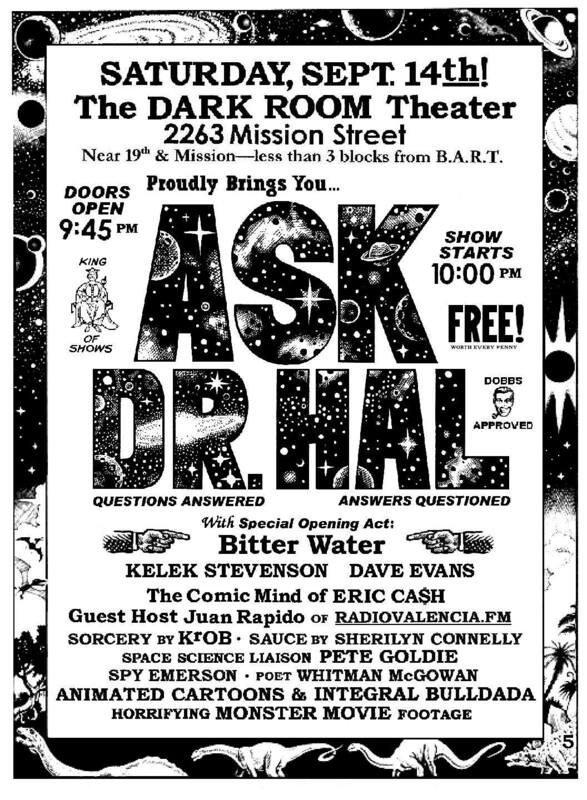 SEPTEMBER 14th IN SAN FRANCISCO there will be another Ask Dr. Hal! at The Dark Room Theater, 2263 Mission St. (between 19th and 20th streets) at 10 PM. And as before in this run, the admission will be FREE. Featured will be poet- performer Whitman McGowan and Girl Friday Spy Emerson. In addition we have the ineffable talents of KrOB in our service, the snark of Sherilyn Connelly, the scientific authority of Pete Goldie, and the question-answering facility of headliner Dr. Howland Owll. We will be hosted by the mordant John Hell of RadioValencia.FM fame, unless he can’t make it (The poor chap’s getting married a week afterward. ), in which case jocund Jim Fourniadis will once again ably handle the hosting, as he did for an enthusiastic audience in July. Friends, we have a great show planned. Opening at The Dark Room for Ask Dr. Hal!’s next iteration on Saturday, September 14th, 2013, will be Bitter Water, a band featuring singer Kelek Stevenson and musical partner Dave Evans. Kelek, known as a spectacular dancer from the Extra Action Marching Band, and who has also delighted many eyes with her numerous public performances, will present her lyrical side as she joins Ask Dr. Hal! to start off September’s show. Come on time to see and hear Bitter Water, an act seen only once before in the long, tatterdemalion history of Ask Dr. Hal!! And so, if Dr. Hal hasn’t perished on the “Playa” in the 110-degree heat and alkaline-poisoned sandstorms of Burning Man, and if he returns whole in body and spirit, you can absolutely depend on there being another show September 14th, remember. A Saturday night. Start thinking of your questions. Mark your calendar! Whitman McGowan will be performing the work of Whitman McGowan as Whitman McGowan. If you go to the ADHshow website you may also see more of Hal’s pr material refer to Whitman McGowan as an “action poet.” In this show his action will consist of walking on stage, speaking, then hurling himself into the frenzied rubbing of the booty shaking crowd, if that’s what the occasion warrents. On the other hand if there are warrants out for his arrest he might have to make use of the stage door of the Dark Room Theater and exeunt stage right at a regular pace, neither running nor skulking, nothing to arouse suspicion, heading en las bas, sur le droit! — W. McG. and T. B. An Equinoctial Appearance and Exemplary Apothegm (see below)! $20 admission – Please bring your own picnic dinner and blanket! 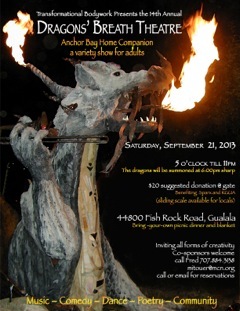 Whitman McGowan will be accompanied by Margery Snyder on flute and Swami Saskatchewan on bird calls as part of a huge bill of musicians, comedians, dancers, poets and circus artists hosted by fantastic and fetching emcee Blake More at Dragon’s Breath Theater, the incredible home baked variety show that takes place annually on the autumnal equinox in a natural amphitheater in the Mendocino woods. See links page elsewhere in this blog for video of a previous DBT performance by Trungpa Bumbleché and other shows recorded by Puzzling Evidence! Check out Stanley’s illuminating writing and amazing collection of quotes on this subject which is so close to the heart of capitalism. This is the first time Trungpa Bumbleché has ever appeared in print! As part of the manic meandering psychedelic shenanigans of The Ask. 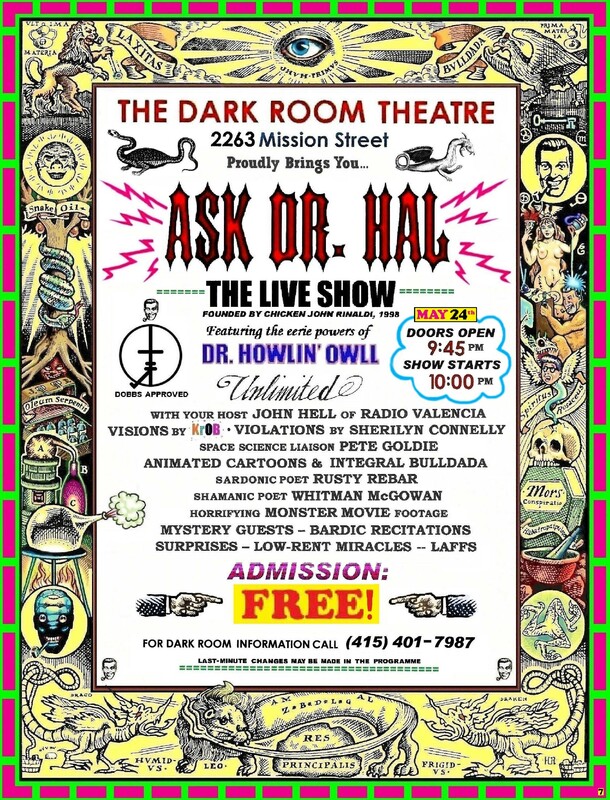 Dr. Hal Show at The Dark Room Theatre (2263 Mission Street in SF) on Friday May 24 at 10pm, I’ll be showcasing another piece from either my Salon des Refusés cd project or my Uncommon Knowledge book project, or both. Doors open at 9:45, so get there early. Our last show there was completely packed. In addition to me and Dr. Howlin’ Owll, of the Church of the Subgenius, the show features emcee John Hell, veejay KrOB, “Violations” by Sherilyn Connelly, a science segment by Pete Goldie, and a whole lot of other neat stuff, and you can’t beat the price of admission, it’s FREE!